The Seville bar stool is modern refined design at its finest. 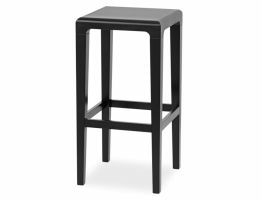 Solid beechwood and first rate European workmanship care of European furniture company, TON CZ, make this stool perfect for your modern kitchen bar and counter seating. The Seville solid beechwood barstool is pictured here in a black finish and offers a rounded edge, smooth surface on which to sit. This solid wood contemporary barstool offers a smooth yet crisp modern form, premium natural European beechwood and careful construction. 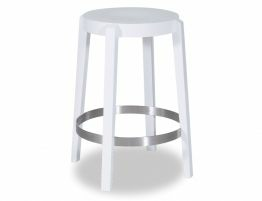 At a height of 65 cm, the Seville kitchen barstool is the appropriate height for most home uses like as a breakfast barstool, kitchen counter stool or for your island seating area. 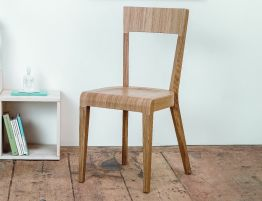 The black finish is displayed here, however, the Seville solid wood barstool is also available in a variety of finishes including a whitewash finish, a walnut finish and a natural finish. Collaborating on the design of the Seville barstool, designers Grimm and Eysser considered every detail, every small bit of finishing until a nearly perfect backless bar stool emerged. The designers found their inspiration for this gorgeous designer wood barstool in the terraced province of Seville, Spain giving this stool its namesake. The look of our solid wood bar stool was heavily informed by the stepped Spanish province. The Spanish region was an inspiring beginning and a splendid muse with both the inherent splendor of the landscape and the always flowing wine the region is famous for. What better wood barstool for wine enthusiasts to sit upon while they sample the many varieties of vino Seville offers. 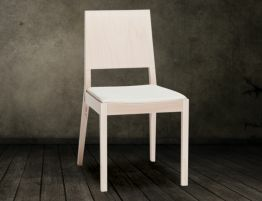 Bring some of the style of that lush and storied Spanish province, into your stylish kitchen with the Seville barstool from TON CZ, fine European furniture makers.